If you fail to prepare then be prepared to fail. In boxing, this means getting beat up and going home the loser. You must take the right measures to go into your fight 100% confident and ready. Follow these 7 steps on how to prepare for a fight and you’ll leave no doubt in your mind on who will have their hands raised when fight night comes around. In order to become a winner, you have to think like one. Learn from the best champions to have ever done it, because they’ve been through exactly what you’re going through now. Constantly watch video footage of fighters that closely resemble your style and try to imitate what they do. You’ll surely pick up a few new tricks to implement in your fight. I also recommend that you pick up a book on some great fighters and read their biography. Immerse yourself in their lives because there’s so much you can learn from a book that you cannot comprehend within a video. I would suggest either Roberto Duran ‘Hands Of Stone’ or Johnny Tapia ‘Mi Vida Loca’. Not only are they very intriguing but you’ll also get a chance to dwell inside the mind frame of a great fighter. You can only get so far on natural talent alone. The rest of your journey is defined by how hard you train. The harder you work, the more confident you get and you’d better believe that your opponent will be training just as hard as you, if not harder. One of the worst feelings is getting in the ring and tiring out after the first couple rounds. You don’t want that to happen no matter how good you are. Work on your endurance as much as physically possible without over training. If you have to fight for 3 rounds, train for 6 rounds. It’s natural to feel nervous and even fearful before a fight, but if the reason is because you know you haven’t put in the time to train as hard as you could have, then you have nobody to blame but yourself. 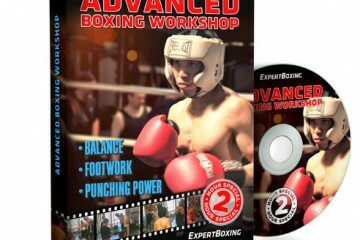 Check out the best rated boxing equipment to train more effectively. The closest preparation for perfection is repetition. You have to do the same moves over and over again if you want to master your technique. Remember to work on your defense as well as your offense, and drill good habits (such as keeping your guard up and moving your head after throwing) into your boxing so that it all just comes natural to you. If your best punch is your left hook, then practice that to perfection but be careful not to become a ‘one trick pony’ because if your opponent figures you out, then he’ll be able to stay one step ahead of you. 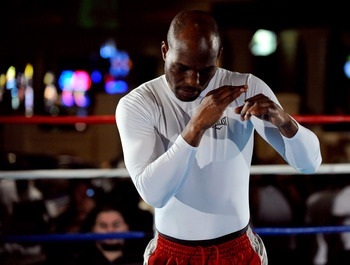 Bernard Hopkins’ first trainer got him to hold a tennis ball by using his chin pressed up against his shoulder to help him keep his chin down. 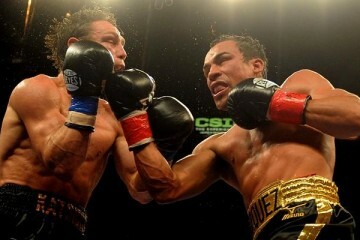 It’s no wonder why he’s one of the best defensive fighters of our era. A supremely confident person is one who knows themselves, and in order to know yourself, you must constantly analyze your actions. When you’re shadowboxing, always look in the mirror. Watch your defense, foot movement and technique. Don’t try to change your style if it doesn’t feel natural, but instead, improve upon it. If you’re sparring, try getting someone to film you, then when you get back home, watch the footage over and over. What mistakes are you making? What bad habits have you picked up? What can you improve on? Be honest and correct those mistakes immediately. The first step to self-improvement is acknowledging that you need improving. Find out as much as you possibly can about your opponent. The better you know your opponent, the more you’ll understand his mentality, style and of course, weaknesses. This doesn’t imply that you should stalk your opponent with an obsession, but rather get bits of information that are vital to your game plan. If you’re just starting out, either as an amateur of professional boxer, it’ll be difficult finding video footage of your opponent. However, you should be able to get an idea of what your opponent looks like whether from a picture or just description. Is he tall or short? Is he a brawler or boxer? Does he have slow or fast hand speed? Take advantage of what you know. It’s tempting to go and grab a juicy burger after a strenuous training session. Maybe you feel that you deserve it. But you don’t deserve anything until you win your fight. 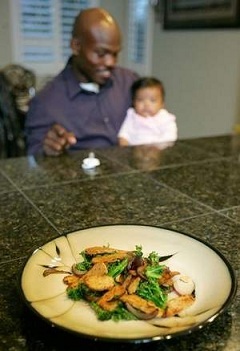 Maintain a healthy diet that consists of white meat (chicken or fish), fruit and vegetables. More and more athletes are beginning to see the benefits of adopting a vegan based diet so perhaps you may also want to give it a try. Drink plenty of water to keep yourself hydrated and to flush out wasteful toxins in your body. Even when you’re not training, you should drink at least 1.2 litres everyday. Avoid fizzy drinks and alcohol like the plague, they will only cause you damage in the long term. You’ll find that if you maintain a healthy diet, you’ll improve your physical, mental and emotional state much more faster. If you want an effective way to maintain a healthy diet, I highly recommend The 30 Day Fighter’s Diet guide, which has helped amateur and pro fighters cut weight while increasing strength. We hear about this time and time again. 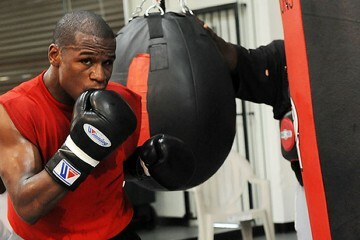 Fighters that train so hard but when it comes to fight night, they under perform because they’ve burnt themselves out. Don’t let this be the case for you. Make sure that you get enough rest for your body to heal. If you feel an unusual pain in any part of your body, allow it to heal before forcing yourself to go on, otherwise you’ll just make it worse and you need to be in the best condition possible for your fight. You should be sleeping for at least 7-8 hours every night. If that’s not possible due to your busy schedule, then try to at least have a 15-30 minute nap during the day to rejuvenate yourself. 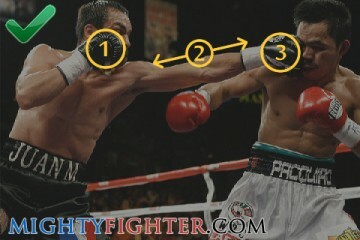 The steps above are general preparations that every fighter should exercise. Some fighters have more personal preferences and methods when it comes to training. Marvin Hagler use to claim that running shoes were for “sissies” so instead, he chose to run in army boots. For effective boxing preparation, it’s always better to get reliable boxing equipment. I highly recommend that you check out the boxing equipment section to find out the best rated products for your training. What works for you when you’re training? What tips would you give to fellow fighters in regards to preparation? Please share your knowledge by leaving your comments below.